The Snowflake Man (my Soul Mate). Thank you, littlesnowflake, for posting this lovely documentary. I enjoyed it and want to share with my readers. More than just a story about a passion, it’s about science, determination and the ability to see beauty in what others take for granted. There was once a man named Wilson Bentley. He was crazy about Snowflakes. He was CRAZY about Snowflakes! Their shapes, sizes, and the fact that no two snowflakes are the same – he was as curious on the topic of snowflakes as Alice was about everything. 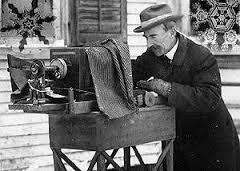 It was this curiosity of his that lead him to inventing a device (microscope + camera) that allowed him to actually witness real snowflakes.